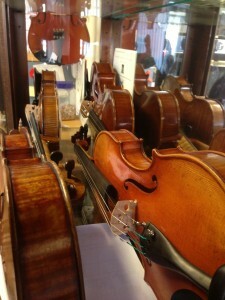 I am asked almost everyday, “how do you price a violin?”, “what effects the price” “Why is this violins so much more then that one”….There are so many factors in the price of a violin, mostly the quality of the materials used, the workmanship, the maker, where it is made, where the wood is from…most people think it is priced on how it sounds….you would be surprised…Below are the top 5 way’s we price a violin in the industry. 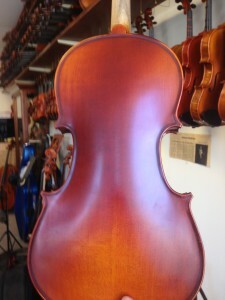 The maker or Luthier who made the violin has a large impact on the price of a violin, if you are a maker of repute your violins carry the reputation, even if it is a shop instrument made by your apprentice or helper it still carries a higher price because of the reputation of the maker. 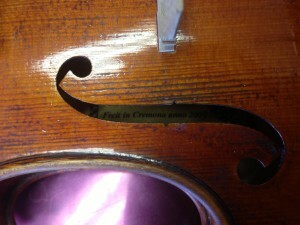 The Luthier or violin maker will often mark his violin with a label and a signature, and in some cases a few different stamps for authenticity inside the violin, some maker’s will give you a certificate of authentication along with the violin, that will have the violins measurements and varnish color and what the violin was model after “Antonio Stradivari” Joseph Guarnieri” and so on, and also have a few picture’s of the violin as well. Some violin’s will have a label inside from the shop and no signature these are usually produced in large quantities using the same mold same design same varnish same model violins, a shop will get that violin from the maker and apply their special touching or a special setup and insert their label inside that violin, though the violin was not made by that shop completely from scratch it is still considered to be made in that shop, because the setup and all the adjustment’s we have made to the violin are what makes the violin sound as it dose. If the violin has a name and a signature it usually commands a higher price because it has been made by one person and requires allot more time and pride to make. Where the violin is made also has a large effect on the price of a violin, a violin made in Germany or Europe will sell for maybe double the price of a similar quality Chinese instrument…That’s not to say one is necessarily better then the other, Europe has some beautiful Violin and skilled maker and so dose China, the top 2 reason’s for the difference in price is the wood (We will get more into that below) and of course the currency and cost of labor difference. I would say you can find great violin’s and craftsmanship from every country…ill only go through a few different countries for now. Violin’s from China, Japan and Korea are generally the lowest priced on the market… actually these 3 countries have the widest range in the market, from some of the lowest priced to some very expensive instruments, depending on the maker. 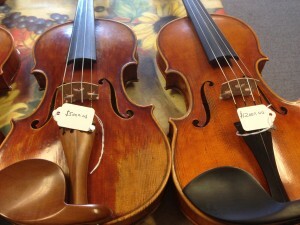 French, German and Italian violin’s are priced above the other countries, Italy being the highest priced followed by France and Germany. Before China became such a large supplier of violins Germany and the Czech Republic where the main suppliers of violin’s for the united states the China started making and became the largest supplier for the world but that’s another story. 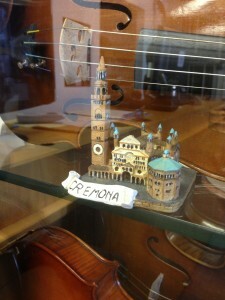 The most famous violin maker in the world is a maker from 300+ years ago named “Antonio Stradivari” from Cremona Italy, he left a legacy of perfection in craftsmanship and sound, and pride that is still found in Cremona and Italian maker’s today, his instruments are still used to this day and are some of the most expensive and best sounding instruments on the market. 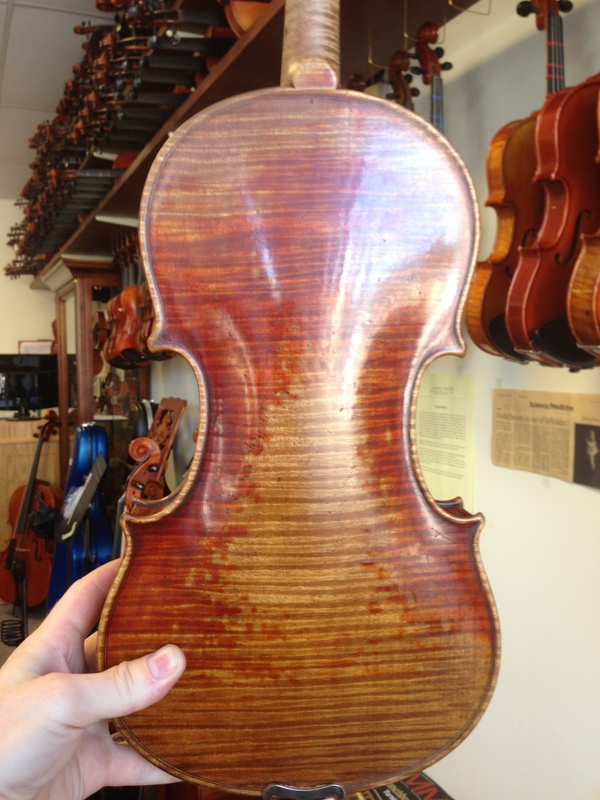 China has come along way in their craftsmanship but it lacks the pride from the maker to match that of a Italian violin this is the biggest difference. You can find quality student instruments from all these countries and more, even some very good professional instruments. 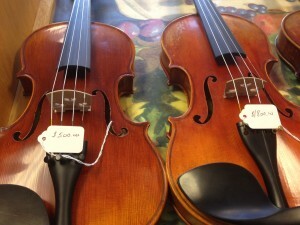 There is a large difference in price, the main thing for the player who is not buying a violin for a investment and is buying the violin to compete, should be the sound. the quality of the material and where it is from makes a large difference as well, the better the material the better the sound (Depending on the maker)can be. Wood from China and america have a brighter sound and are priced lower then that of European wood, which has a Sweater and warmer tone. 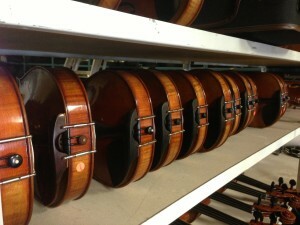 the space of the grain on the top of the violin makes difference in sound and strength and quality. The “Flame” or as some say “Tiger stripe” on the back and sides and scroll of the violin has a larger effect on price then that of the top spruce grain, a high “Flame” content is highly desired for its beauty, higher the flame more expensive the violin usually, and better the sound, compared to a violin with little or no “Flame” as pictured above, mostly found on student instrument’s. A skilled maker or player can recognize where the maple is from by looking at the back of the violin, American and European wood look different from each other and is hard to explain in writing so i will not go into it. The workmanship or skill with which the violin is made is another way violin are priced and valued, Higher the skill higher the price, some very skilled maker’s are not very well known so will not have as high a price as that of a less skilled but more well known maker….A good violin will take about 300+ hours to make, a good maker will take his time and make everything as perfect as he can, and have pride in his skill, and add his or her own style to the violin. Workmanship it hard for the untrained eye to see, you have to look at the whole violin, the corner’s, F holes, scroll,ribs, purfling everything as a whole the arch the curves, Varnish… it is very hard for average people to really see, but if you look close you can see the pride the Luthier or Craftsman took in his art.